In some places kystybyj name kuzikmak or jakmysh. Usually he is prepared from a unleavened dough. Filling can be different, mostly it is a potato, rarer than porridge or poppy. 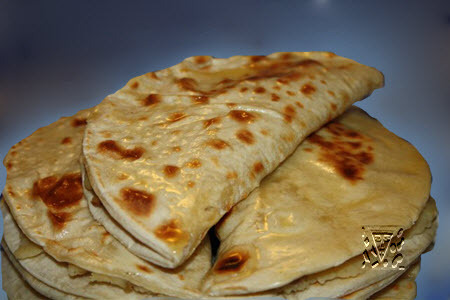 To cut unleavened dough to pieces for 75 g, to roll on thin small cakes and bake on a burning hot dry frying pan to the rosy crust. To cover the prepared small cakes a napkin, that they did not harden and did not get cold. 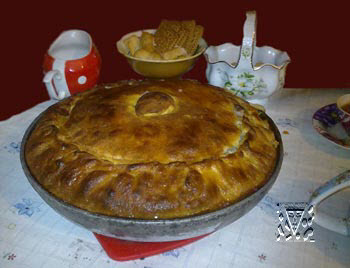 Filling is made out of the mashed potatoes with hot milk, kindled by oil and passed onions. Filling is laid on a half yet hotter than small cake and cover the second half. Smearing prepared kystybyj the drowned oil give in a hot kind to tea. To sift a poppy and soak in hot water. To cast aside a dropsical poppy on a sieve and, giving to flow to water, to pound in a mortar. Then to add a bit sour cream and saccharine to sand. To inlay the got mass in arcuated twice small cakes. On 1 kystybyj: a 75 g of unleavened dough, 80-100 g of poppy, 20 g of oil, 20 g of sour cream, 20 g of sugar. 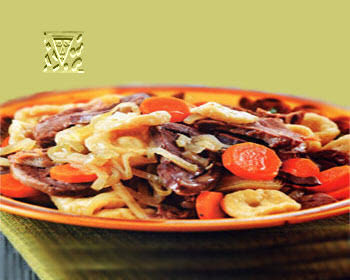 Bishbarmak is favourite food Kazakh, Kirghiz people, greatest food for guests. The cleaned, washed meat of mutton is cooked by hunches, adding salt, pepper, laurel sheet. Fat from clear soup is constantly taken off. 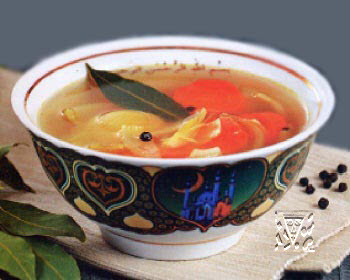 The prepared meat is cut cross-grained by thin wide slices (approximately 4x4 cm), inundate fourth part of clear soup, adding the finely cut onion, pepper, spicy greenery. For a noodle from a flour, egg, water and salt to knead dough, roll him in a layer in a 1 mm thick, to cut large squares (6х6 cm) and to boil in clear soup, got at cooking of meat, with addition of head of onion and parsley. 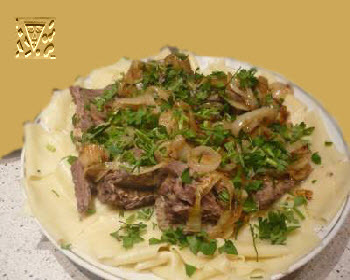 To lay out the prepared noodle in deep piattis, pour by warmed-up fat, taken off from clear soup, to sprinkle with a pepper, greenery of parsley and ramson, from above to put a hill geared-up meat (both pulp and meat cut by slices with bones) and to inundate everything small part of clear soup. Remaining part of clear soup meat cooked in which, to connect with clear soup a noodle was boiled in which, warm up and give separately in drinking bowls, sprinkling with a ramson and parsley. on a 1 portion: a 150-200 g of meat, 60-70 g of onion, 60-80 g of flour, 1/5 part of egg, other to taste.